Make sure your computer operating system and web browser are on the list of supported platforms. Go to Control Panel > Programs and features and, if required, uninstall existing versions of the plug in. Open an InPrivate browsing session in Internet Explorer and try joining the meeting again. If that succeeds, consider clearing your browser cache to remove obsolete credentials that might be interfering with sign-in. If you still can’t install the plug-in, review this list of issues and errors. Make sure your browser is set up to allow downloads, and the downloading of encrypted files. Scroll down to Downloads and click Enable for File download. Re-join the meeting. The plug-in should download without errors. Go to Tools > Internet Options > Advanced. Clear Do not save encrypted pages to disk and click OK.
Exit the meeting and re-join it. A dialog box displays with options to save the plug-in file or run it. Specify a location on your computer to save the file, and then click Save. Locate the saved plug-in file on your computer and double-click to run it. If you get the notification to install the plug-in even after installing it, restart your browser. If you’re running Windows 8 on your PC, make sure that you’re running the version of the browser for the desktop. This issue can also occur if you’ve launched your browser with the Run As Administrator option. Lync Web App is not supported in this environment. To use Lync Web App, launch your browser as a standard user. You may need to change your browser settings to allow ActiveX controls. Important: If you're unable to change ActiveX settings, you might not have permission to and you should check with your workplace technical support. Tap or click the Filter button in the address bar, and then tap or click Turn off ActiveX Filtering. If the Filter button doesn't appear in the address bar, no ActiveX content is being filtered on the site. Allow Automatic prompting for ActiveX controls by tapping or clicking Enable. Allow Internet Explorer to Display video and animation on a webpage that doesn't use external media player by tapping or clicking Enable. Allow Internet Explorer to Download signed ActiveX controls by tapping or clicking Enable, or Prompt if you want to be notified each time this happens. Allow Internet Explorer to Run ActiveX controls and plug-ins by tapping or clicking Enable, or Prompt if you want to be notified each time this happens. Allow Internet Explorer to Script ActiveX controls marked safe for scripting by tapping or clicking Enable, or Prompt if you want to be notified each time this happens. In the Windows Firewall security alert, it’s OK to select Cancel if you don’t have administrator privileges on your computer. When installing the plug-in, you’re given the option to trust the domain that loads the plug-in. Select Microsoft Lync Web App Plug-in from the list of installed programs in Control Panel, and click Uninstall. 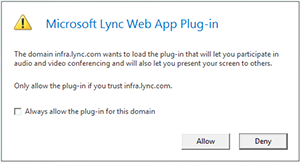 The next time you join a meeting with Lync Web App, select Allow to trust the plug-in domain for just that meeting. Open ~\Library\Preferences\rtcpal_registry.reg in the text editor. Delete the line for the domain you want to stop trusting. For example, to stop trusting the domain Contoso.com, delete the line "Lync.Contoso.com"=""
Your organization’s computer policies might be preventing the plug-in installation. To resolve this issue, contact your workplace technical support.